Are you fixated on the Nutrition Facts box? You know, the black and white box on the label of processed, packed food? Are you noting the vitamins, minerals and nutrient levels? Are you counting calories? Have you stopped to ask yourself, "should I be counting calories?" You may have noticed that my recipes don't include calorie counts, even though I'm asked for them time and time again. 1. Counting calories has limitations & it's misused by the diet industry. Counting calories leads you to believe that health and weight loss is simply addition (or subtraction). If calories in < calories out = weight loss! Didn't you know? 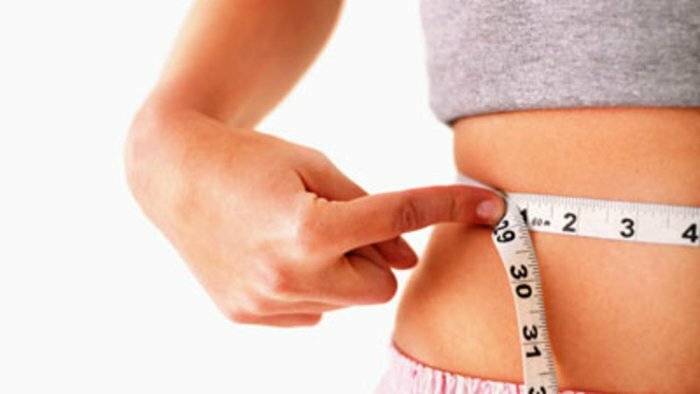 Simply reduce your calories and you will lose weight! As many of you know, this is simply not the case. You can 'eat like a bird' and still hold on to stubborn weight. In fact, I dedicated a whole book to the science of weight loss and the delicious recipes that will support you to shed your stubborn pounds. It's called, Slimming Meals That Heal: Lose Weight Without Dieting Using Anti-Inflammatory Superfoods. Today’s common method of counting calories is not a fine science. It is a blunt tool that can only be used to monitor the general tread of caloric intake. American chemist, Wilbur Olin Atwater, developed the method of ‘measuring’ a calorie over 100 years ago. His work is a vital cornerstone of the study into human nutrition and, upon closer examination, it appears not all of his findings have been taken into consideration. A calorie is the amount of heat energy needed to raise the temperature of 1 kg of water 1 degree Celsius. The Atwater System suggests that the calorie composition of a food is made up of the number of grams of carbohydrates, proteins and fats present. In general, for every gram of carbohydrate or protein, 4 calories must be counted. 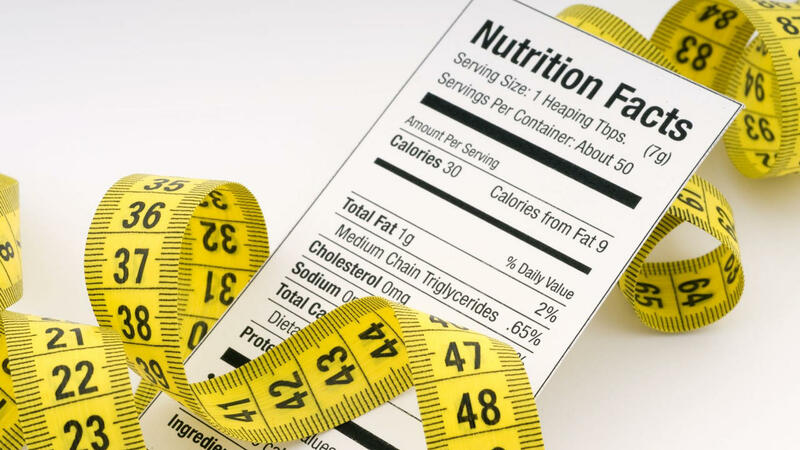 For every gram of fat, 9 calories must be counted. The sum total of these parts gives you the amount of calories (energy) present in each food item. The food industry’s interpretation of the Atwater System relies on the idea that 'a carrot, is a carrot, is a carrot'. In reality, the amount of calories and nutrients (protein, carbohydrate, fat, vitamins and minerals) present will change depending on how the food was grown, how ripe a food is at the time of harvesting, the length of time a food is stored, how a food is processed and how a food is cooked or prepared. In July 2012, there was a study released in the American Journal of Clinical Nutrition by the United States Department of Agriculture that found that almonds had about 20% fewer calories than originally thought. Why? Because the generalization of the value of fat has led to the overvaluing or undervaluing of the caloric content of many foods. For example, a vegetable fat has a different caloric value that an animal fat. Interpretation of the Atwater System doesn’t take into consideration the biological interactions of the different components in a food or the caloric ‘availability’ (as Atwater would say). For example, if a food is high in fibre, this component will affect the absorption of all the other factors such as carbohydrates and fats. 2. 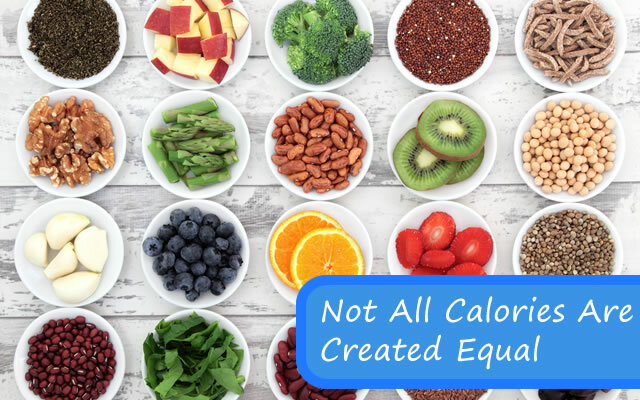 Not all calories are created equal. A large segment of the modern diet industry is founded on the concept that if you count calories and reduce the amount you consume, you will lose weight regardless of the type of food you eat. 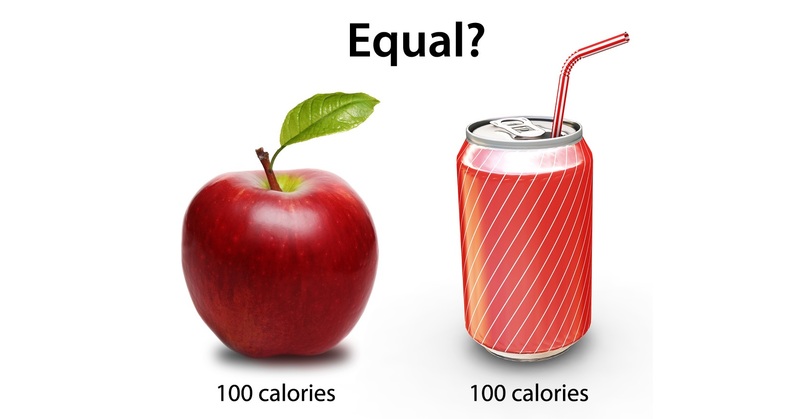 In a Journal of the American Medical Association study released in June 2012, it was determined that not all calories are created equal. The study was conducted on 3 groups of obese subjects who were all given the same amount of calories for 4 weeks. Group #1 consumed an isocaloric low-fat diet (60% of energy from carbohydrate, 20% fat, 20% protein; high glycemic load). Group #2 consumed a low–glycemic index diet (40% carbohydrate, 40% fat, 20% protein; moderate glycemic load). Group #3 consumed a very low-carbohydrate diet (10% carb, 60% fat, 30% protein; low glycemic load). Low-Fat Group #1 (60-20-20; high carb - low fat - low protein) burned the least amount of calories (300 fewer calories that Group 3) and did not lose as much weight as the other two groups. Low-Glycemic Group #2 (40-40-20; mid carb - mid fat - low protein) burned about 150 fewer calories than group 3. Low-Carb Group #3 (10-60-30; low carb - high fat - high protein) burned the most calories and lost the most weight. Let’s look at the case of coconut oil. Science shows that eating coconut oil provides your body with energy without fat accumulation. The medium chain fatty acids found in coconut oil are used by your body to produce energy rather than storing it as fat. Traditional sources of fat are broken down into individual fatty acids and then regrouped into bundles of fat and protein called lipoproteins. These lipoproteins are sent into your bloodstream so that the fatty acids can be deposited into your fat cells. Medium chain fatty acids found in coconut oil are used differently in your body. Instead of being packaged into lipoproteins and circulated in your bloodstream, they’re sent directly to your liver where they are converted into energy, much like a carbohydrate. 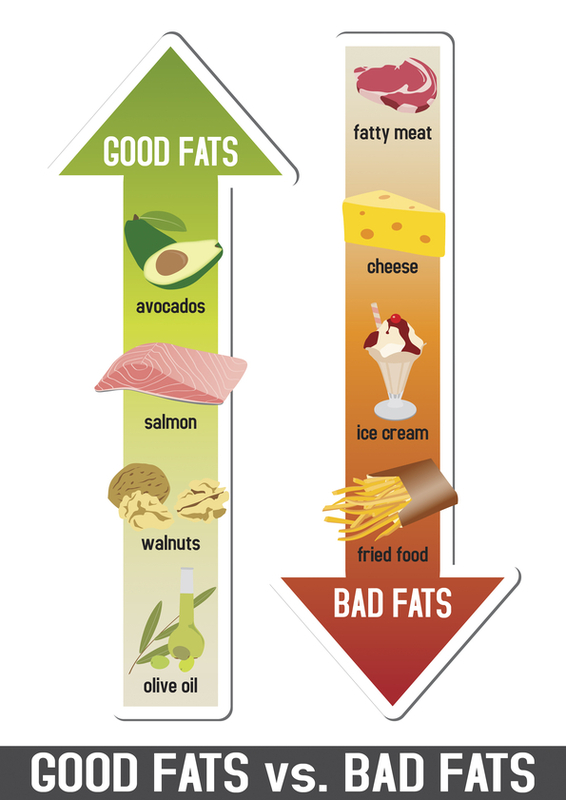 These energy-producing fats do not raise blood sugar so, they’re a good option for diabetics. Coconut oil can boost your metabolism because it has a thermogenic, or calorie-burning, effect. This is because the medium chain triglycerides (MCTs) in coconut oil are easily absorbed by the energy-producing organelles of your cells. Studies have shown that after eating a meal containing MCTs from coconut oil, your metabolism stays elevated for at least 24 hours! Not only will you be burning calories at a faster rate, you will have more energy. 4. Should you stop counting calories? Maybe. So, do I throw out the concept of counting calories all together? I won’t go that far. Atwater would agree that having a general idea of the caloric value of a food is valuable information; however, it's only one part of a healthy Live-it. If you're carrying too much weight on your body, chances are you are eating more calories that you need from foods that are devoid of other important nutrients. There are a host of nutrients and co-factors that your body requires to properly break down and absorb the food you consume. Without these nutrients your body can be left overfed AND undernourished. Are you eating highly processed foods? Highly processed foods cause inflammation in your body, so some of extra weight you are carrying could be your body’s response to that inflammation. It is also important to remember that you cannot use a ‘good’ diet and pills as a substitute for daily exercise. Your body was meant to move, lift and stretch… every day. Once you have determined which healthy Live-It – filled with vegetation and a healthy dose of organic protein, fats and carbs – counting calories will no longer be an issue.